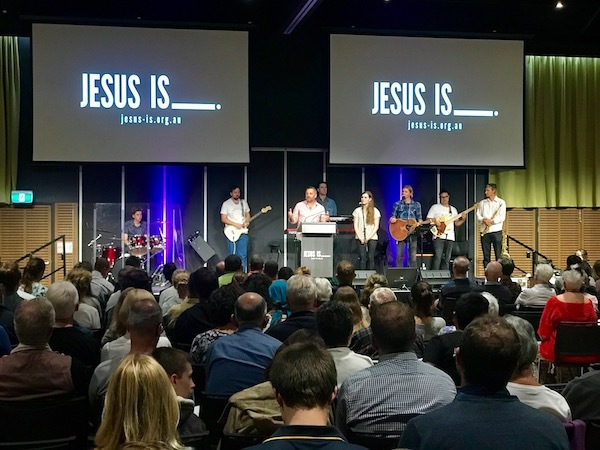 There has been a lot happening this week as our church and the churches in our region have partnered with Moore College students to run many Jesus is___. events. Hundreds of people have attended the public sessions at the Civic Centre, over 1000 students have been at special SRE assemblies, and 2000 high-schoolers were at the Free To Be event. At the heart of all this flurry of activity is one simple message: Jesus is the great exchange. There were lots of events this week, but there is only one event that really matters: it is the moment where this great exchange takes place in your life. No-one else will see this moment, for it takes place in your heart, and yet at the same time it is a cosmic event. 1 Peter 3:18 says “For Christ suffered once for sins, the righteous for the unrighteous, to bring you to God”. The great exchange is this: Jesus stands in our place; he swaps his life for ours and he does it so that he might brings us back home to God. Ben Pfahlert, the speaker at the public sessions, put it like this: He took our place that we might reconnect with our spiritual old man. In this great exchange we are solely the receivers. We offer nothing as part of of the deal. God himself, out of only love, offers us it all. Nothing can rival this offer, so we can leave all gain behind. And nothing can take it away, so our heart is assured and our fears are calmed. His life for ours, that he might give take us home.